The wheels of justice continue to grind slowly with regards to cases related to the Standing Rock protests. 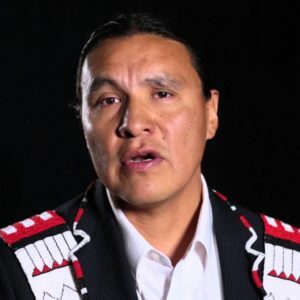 Today, Indian rights activist and former Congressional candidate, Chase Iron Eyes appeared in court on charges related to the Dakota Access Pipeline protests which occurred more than a year ago. Since Red Fawn Fallis, another activist facing felony charges, took a plea bargain in mid-January, Iron Eyes is one of the most visible figures still fighting cases in court. The case is a sign of how the struggle still continues, even as broader interest in the pipeline fight has diminished. On Wednesday, Iron Eyes appeared in court again has part of his ongoing fight against a felony charge of inciting a riot. During the height of the Standing Rock protests in North Dakota, crowds of protesters regularly formed outside of the Morton County government offices and the local court building. For Wednesday’s hearing, only a handful of people responded to a Facebook post announcing a demonstration in support of Iron Eyes. Today’s hearing was the latest step in Iron Eyes’ attempt to plead necessity–the same strategy used successfully by pipeline protesters in Massachusetts last week. He and his legal counsel have been pressuring the state to release internal memos between local police forces and the private security firm TigerSwan, which was employed to aid law enforcement during the protest. The attorneys also requested documentation from then-Governor Doug Bergum’s office. Iron Eyes hopes to plead that his actions may have been unlawful, but were necessary in order to stop a greater harm from taking place. The standard example of this defense is throwing cargo overboard to lighten a sinking ship. However, a judge in Massachusetts recently ruled in favor of environmental activists who argued that global warming was a similar harm that warranted criminal activity. A hearing for the in late August, before a trial in November. Instead of being the focus of attention, the trial has been largely unnoticed by local media and even some of the environmental groups that had supported the DAPL protests. At this point, the likelihood of Iron Eyes’ defense being successful is uncertain. Iron Eyes has previous felony convictions for possession of a stolen firearm, burglary, theft of property, and resisting arrest–all related to a drunken incident in 2002. As a candidate for office, he has been open about this low point in his past and the more than a decade of sobriety which has followed. Meanwhile, North Dakota officials are hopeful that 2018 will mark the end of the Standing Rock trials. Given the sheer number of cases and the small size of North Dakota’s judicial apparatus, working through the caseload has taken years, straining the state’s limited resources.